Panorama Veterinary Clinic and Specialist Centre is currently the only veterinary hospital in the Cape Province to offer specialist surgical services including total hip replacements on dogs and a Cats Clinic. As in human medicine and surgery, a veterinarian may only claim to be a “specialist” or “expert” in a certain field once he/she has satisfied the South African Veterinary Council that all requirements for specialization have been met. These requirements include an additional period at a University veterinary hospital undergoing advanced training under the guidance of established specialists in that field, a Post-graduate Master’s Degree, contributions (in the form of published research papers and a thesis) to the body of scientific information in that field, and rigorous testing and evaluation by established specialists. General veterinary practitioners will refer cases for surgery where they feel that the patient will benefit from either facilities or expertise that they don’t have available in their own veterinary clinics. Should you wish to have your dog or cat operated on by a qualified specialist, it is usually best to ask for a referral from your veterinary practitioner. Most will have no problem with this and veterinarians are not permitted to refuse such a request. Referral from a vet offers a number of advantages: it maximizes the chance that you will be referred to the correct specialist (e.g. a surgeon will not be able to offer a specialist opinion on diabetes). It also enables the referring veterinarian and specialist to have open communication lines with regard to previous diagnostics, treatment, etc. 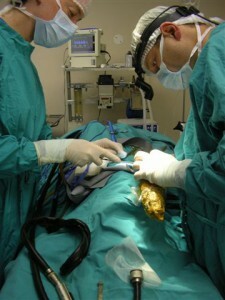 and post-surgical care of your pet– we like to work WITH everyone. Please telephone the clinic to make an appointment so that the veterinary specialist has enough time to discuss your pets’ condition fully with you. The specialist will use this time to review your pet’s history, examine him/her, and discuss options with you regarding further investigation or treatment for your pet. Cost implications will also be discussed at this time. It is usually best to not feed breakfast on the day of the consultation in case diagnostic or surgical procedures are required. Please check with your referring veterinarian if there is anything that he/she would like you to bring along (e.g. x-rays, lab reports, history of treatment etc.) as this will save you time and money. 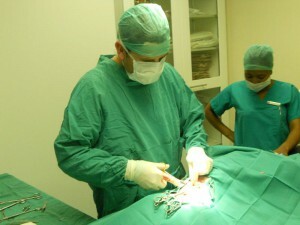 We will always try our best to perform a surgical procedure on the day that it is booked. Occasionally the schedule can’t be adhered to because another procedure took longer than expected or pet emergencies have arrived unannounced. We ask for your understanding when a delay is unavoidable. If your pet is in need of immediate emergency care, someone else will have to make way for him/her. Please note that the initial consultation fee is payable up front. All surgical procedures/hospitalisation must be paid in full on day of discharge. Cash and credit cards are accepted. We don’t accept cheques. Internet transfers are acceptable for payment of surgical procedures (not consultations). Please bring proof of payment with on day of discharge.